Oh! 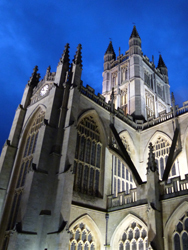 Who could ever be tired of Bath? and Bath was to be her home. but beyond that, it is the most tiresome place in the world! 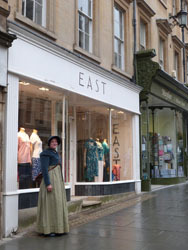 But after reading a few letters from her, we are not entirely sure, that she too - like Anne Elliot - liked Bath so little! 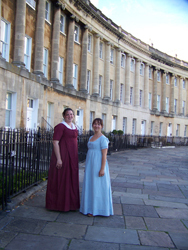 Of course she enjoyed her life in Hampshire, but would she send two of her heroines there to find their fortune, when she really so disliked the city of Bath? 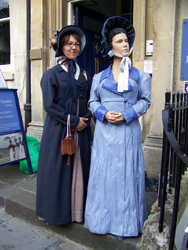 The Jane Austen Centre can not be missed - because of the life-size figure of Jane Austen. Next to it stands normally one of the most photographed man in England – the „Meeter and Greeter“ from the Jane Austen Centre: Martin Salter. 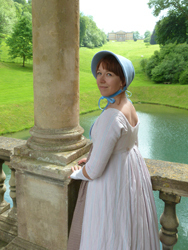 There is a little exhibition from the life of Jane Austen, her novels and the film adaptations of her work (among others film costumes). 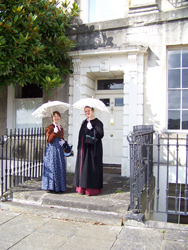 On the ground floor you can find a nice Jane-Austen-shop and on the second floor invites the „Regency-Tearooms“ to drink „Tea with Mr. Darcy“. 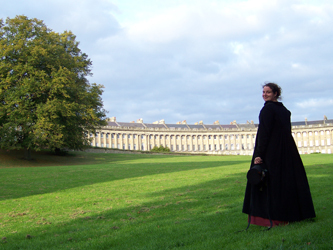 The semicircular building is the landmark of Bath and is backdrop for many movies (among others Persuasion 2007, The Duchess). to breathe the fresh air of better company. 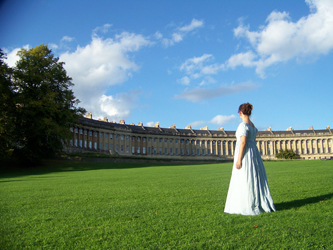 In Royal Crescent No.1 you find a museum, which shows insights into a georgian urban villa and the life of wealthy families in the 18th Century. Since 2013 the museum has been extended by some rooms of the adjoining building and now shows rooms away from the high society: laundry room, rooms of servants, etc. The Royal Victoria Park next to the Royal Crescent is the biggest park of Bath. In Jane Austens time known as „Crescent Fields“; but renamed after Queen Victorias visit in 1830 in „Royal Victoria Park“ to honor her. walked a little in the Crescent fields, but found it too cold to stay long. 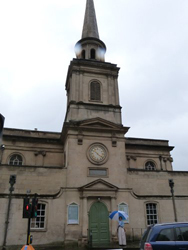 Also this building is shown in a film adaptation: e.g. Persuasion (2007): Anne Elliot and Lady Russell drive along the Circus in a carriage, while they talk about the expected engagement between Captain Wentworth and Luisa Musgrove. 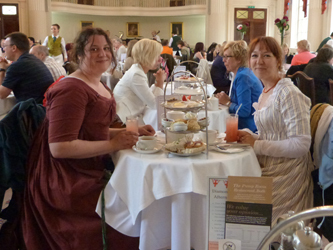 In the middle of the 18th century the Assembly Rooms were a meeting place for social life; here you meet for balls, concerts, to play cards etc. Even today the rooms can be booked for balls and weddings. 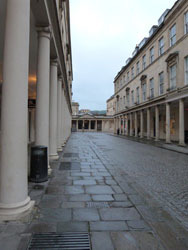 And you can see the Assembly Rooms also in film adaptations; among others in Persuasion (1994 and 2007), The Duchess. that they did not enter the ball-room till late. 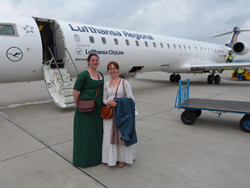 and the two ladies squeezed in as well as they could. and left them to enjoy a mob by themselves. 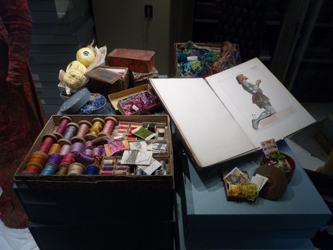 On the basement is the Fashion Museum located, which shows dresses from the 16 th century until today . The exhibitions are changing nearly yearly. And in the Museum Shop you find a lot of fashion books, postcards, etc. that green was a favourit colour with her. 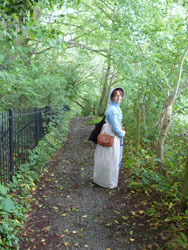 In Jane Austens novel „Persuasion“ the Gravel Walk is a very special and romantic walk. 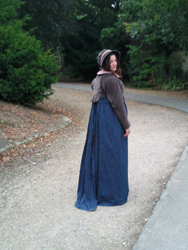 Anyhow Anne Elliot and Captain Frederick Wentworth choose this beautiful walk for their first steps together, after their renewed engagement. On the Gravel Walk is the entry to a little Georgian Garden. It is open daily from 9am to 16.30pm and the entry is free. ... and soon words enough had passed between them to decide their direction towards the comparatively quiet and retired gravel walk, where the power of conversation would make the present hour a blessing indeed, and prepare for it all the immortality which the happiest recollections of their own future lives could bestow. The late Gothic Abbey is also known as „Lantern of the West“ because of the beautiful windows. Interesting are also the many memorial stones, which can be found on the walls. 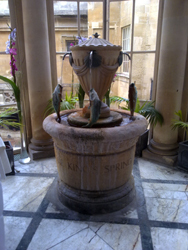 Bath owes the only british hot spring the city founding and also the reputation of the most important spa town in the 17th and 18th century . 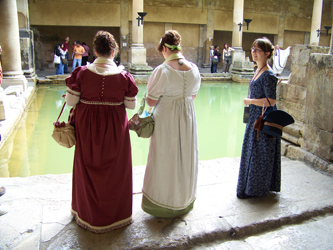 The Roman Bath Museum tells about the history and shows the old roman temple complex. 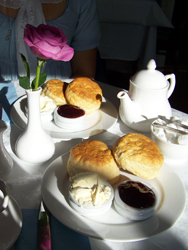 You can take your Afternoon Tea while listen to the piano player in the Pump Room - very classy! Do not get discouraged because of the waiting lane! and almost every new bonnet in the room. 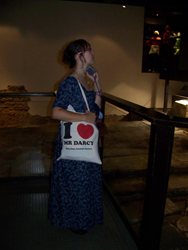 Jane Austen and her family know the Bath Street very well. 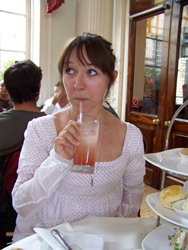 Her aunt, Mrs. Jane Leigh-Perrot, was accused of stealing a small piece of lace in a shop. While the proceeding it came out, that it was smuggled into her purchases, with the intention to blackmail her. and a gentleman with her. 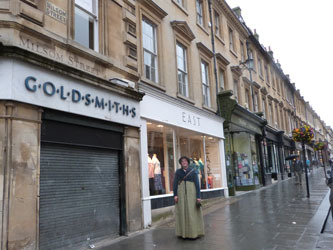 I saw them turn the corner from Bath Street just now. They seemed deep in talk. Who is it? Come, and tell me. Good heavens! I recollect. It is Mr. Elliot himself. 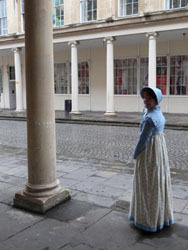 Even Jane Austen estimates the many shops in Milsom Street and also her heroines stroll through this shopping street: in „Northanger Abbey“ Catherine Morland and Mrs. Allen go shopping here; in „Persuasion“ the sisters Elliot and Mrs. Clay visit the pastry shop „Molland´s“. I quite longed for it. 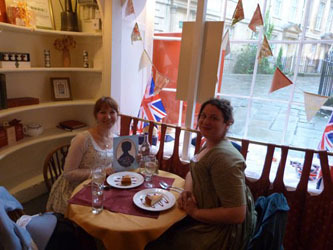 The oldest house of Bath is now a restaurant, which is famous for the Sally Lunn Bun. 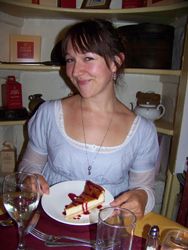 It is believed that the French woman Solange Luyon brought the recipe with her. 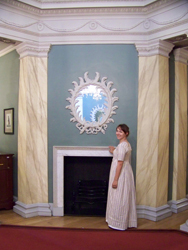 On the first floor you can have a seat in the „Jane Austen Room“ and on the basement you can find a little kitchen museum. The Pulteney Bridge is built upon both sides with shops, and is so one of three bridges in that style worldwide (the two others are the Rialto Bridge in Venice and the Ponte Vecchio in Florence). 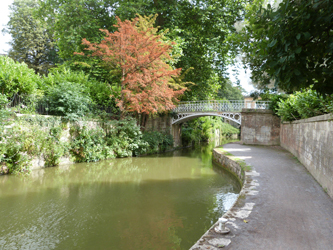 You have a great view at the bridge from Parade Gardens - a small park, lying on the river Avon. 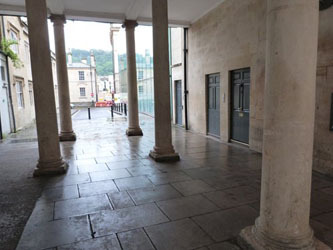 The entrance is between Grand Parade/Orange Grove/Pierrepont Street (September 2010: £1). Sydney Place Nr. 4 is one address, where the Austens lived. The house is private property and could therefore not be visited; in the meantime parts of it can be rent as a holiday apartment. On our last visit in Bath we were surprisingly invited to one apartment, and so we could view some rooms , the staircase, etc. Each building is now private and not open for public! 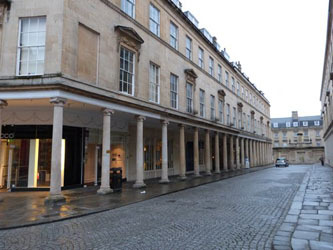 At the end of Great Pulteney Street is the Holburne Museum, Baths art museum. In Jane Austens time it is known as „Sydney Tavern“ or „Sydney Hotel“ and location for meetings, balls, concerts, etc. It would be very pleasant to be near Sidney Gardens! We might go into the labyrinth every day. 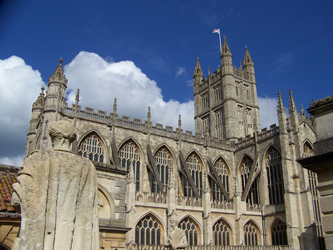 The Walcot Church appears twice in the chronicle of the Austen family. Jane Austens parents, Reverend George Austen und Cassandra Leigh, married there in 1764. 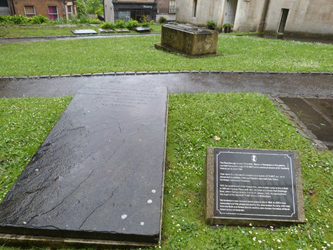 In 1805 Jane Austens father died in Bath - you can find his gravestone at the little churchyard. 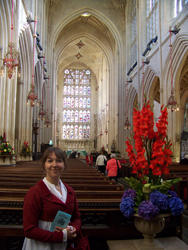 The Funeral is to be on Saturday, at Walcot Church. Under this stone rest the Remains of the Rev. George Austen, Rector of Steventon und Dean in Hampshire. He departed this life on 21 January 1805. Aged 73 years. 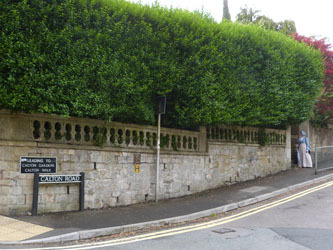 Camden Place can be found on the map as „Camden Crescent“. 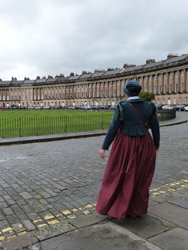 Apropos: in the film adaptation of Persuasion from 2007, Anne Elliot doesn´t run out of this building for speaking with Captain Wentworth – but from the Royal Crescent Nr. 1! and both he and Elizabeth were settled there, much to their satisfaction. 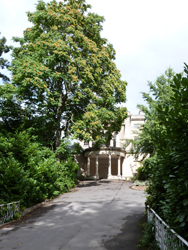 The way to Alexandra Park on Beechen Cliff is not only for Janeites, but also for Bath visitors interesting. 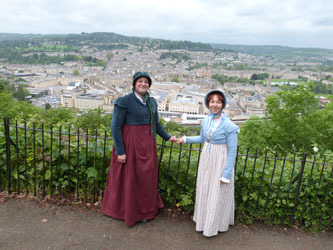 You have an impressive view over the city of Bath! 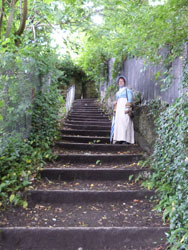 The way that is mentioned in Jane Austen letters, leads up over Lyncombe Vale Road and Greenway Lane and offers some beautiul view points towards Prior Park. render it so striking an object from almost every opening in Bath. 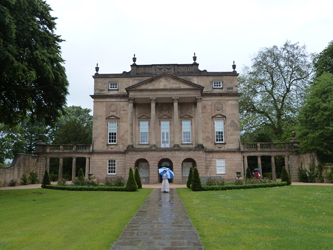 The completely neglected Prior Park was incured by the National Trust at the 1990ies and was reconstructed from old plans. 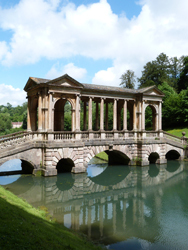 While a walk through the park you can see the beautiful Palladian Bridge, but you can also enjoy a great view over the city of Bath. The former manor of Ralph Allen up on the hill harbored today a school. 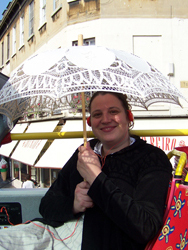 The easiest way to the Prior Park Landscape Garden is to go by „Bath City Sightseeing Bus (Skyline Tour). Your busticket reduces the price for the ticket into the park! 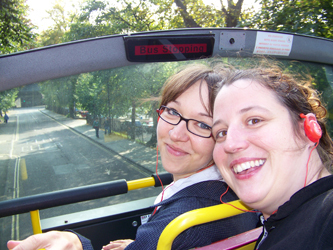 With buying a ticket (Juni 2012: £12,50) you can use the City Sightseeing Busses for 24 hours. One bus goes through the city, while the other one explores the surroundings (e.g. 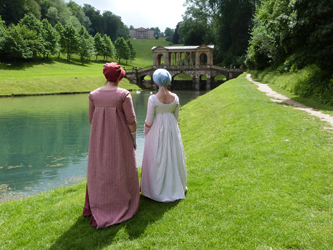 Prior Park Landscape Garden). Through headphones you get many informations and the history of sights, buildings, etc. With the busticket you get reduced entrance to some museums. without the exchange of many words. 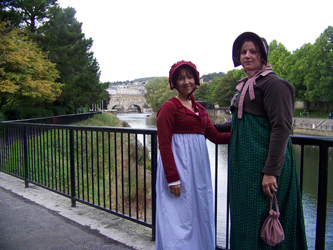 We highly recommend the „Regency Costumed Promenade“! 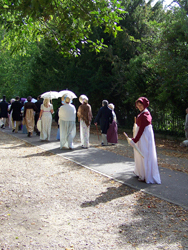 In 2009 during the festival, there was a world record attempt for „The largest gathering of people dressed in Regency costumes“ (to find in the Book of Records 2012). 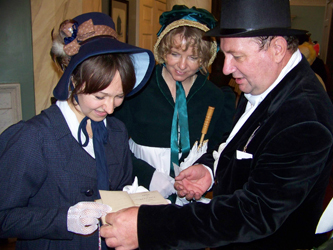 Tickets for the Promenade and the Festival-Friends-Tickets are available in the Jane Austen Centre Shop; every other tickets are sold by the Festival-Box-Office. 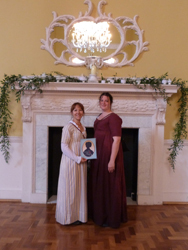 First edition "Pride and Prejudice"